Have you tried growing potatoes in your garden? Growing potatoes is fun and not that difficult! You can grow unique varieties not found in supermarkets. I have several articles about growing potatoes on this website that are very popular. It is clear that many of you want to know more about growing, storing, and cooking with potatoes. 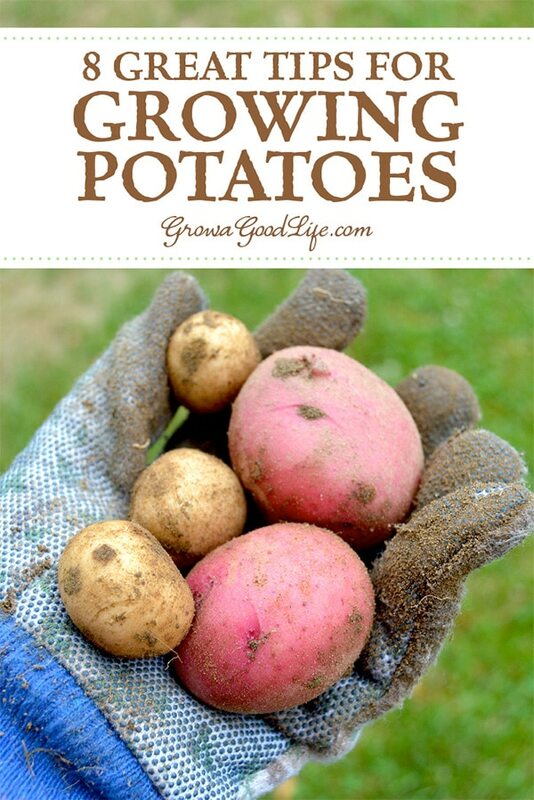 I have gathered these articles together, expanded on the information, added new information not found on the website, and published a PDF eBook, Grow a Good Life Guide to Growing Potatoes. Potatoes are easy to grow, store well through the winter, and provide a nutritious addition to meals. There’s nothing like the flavor of freshly dug potatoes and the knowledge that they were grown in a pesticide-free environment in your own backyard garden. Whether you are striving for a few gourmet fingerling potatoes for fresh eating or growing a large crop for winter food storage, this book will show you how can grow your own, homegrown potatoes. 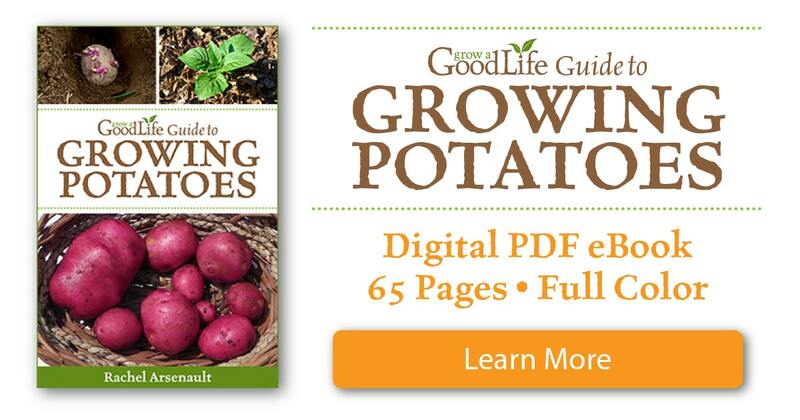 Check out the PDF eBook, Grow a Good Life Guide to Growing Potatoes and plant some potatoes this year! 1. Plant Certified Seed Potatoes: When you plant seed potatoes, you are planting a potato produced by the plant the previous year. Any diseases or insects that the mother plant may have had are carried over in the seed potato. Planting certified seed potatoes ensures that you are starting with disease free potatoes. 2. Chit Your Potatoes: Give your potato seeds a head start by pre-sprouting or chitting them before planting into the ground. 3. Grow in Full Sun: Grow your potatoes where they will receive full sun (6-8 hours per day) planted in an acidic, well-drained soil. 4. Plant Potatoes in Early Spring: Potatoes prefer cooler weather. They can be planted as soon as the ground can be worked in the early spring, once the soil temperature reaches 45˚F. Wet, waterlogged soil will cause the seed potatoes to rot. So depending on how rainy your springs are, it may be better to wait until the soil dries out a bit. 5. Water Consistently: Maintain a consistent moisture level in the potato bed averaging about 1-2 inches (2.5-5 cm) of water per week. 6. Keep the Tubers Covered: Prevent your potatoes from forming green skin by covering with soil or mulching heavily so that no light reaches the tubers. 7. Let the Potatoes Mature Fully for Food Storage: You can begin harvesting new potatoes as needed for meals after the plants bloom. If you are growing potatoes for storage, allow the tubers to remain in the ground to mature. Cure unwashed potatoes before storing so the skins heal over and thicken up. Store cured tubers in a dark area in covered boxes or bins with some holes for ventilation. Ideal storage conditions for potatoes are at 32-40˚F and 80-90% relative humidity. 8. Rotate Your Potato Crop for Healthy Soil: Potatoes should be rotated in the garden on a 3-year system. This means you shouldn’t grow potatoes in the same spot until 3 or 4 years later. Follow potatoes with beans, leafy greens, a cover crop, or another non-Solanaceae family crop. Once you understand the basics, potatoes are relatively easy to grow. They are fun to grow too since there are so many planting methods to experiment with. The reward is a delicious, organic, nutrient-dense food source that you can feed your family. Also gratifying is the feeling of pride over the fact that you grew them yourself. When do you know the potatoes are ready for harvesting. Can you pull it out and check? New to gardening. 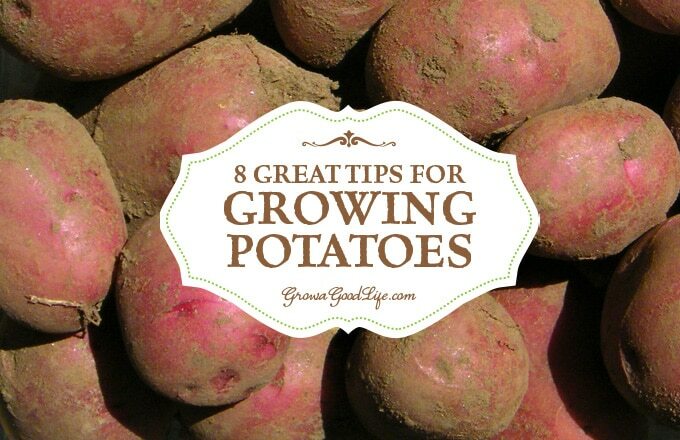 These are GREAT tips for growing potatoes…one of my favorite crops, by the way. It seems that each year more and more of my garden gets planted to potatoes! Thanks for all of your amazing gardening posts. I learn so much from you! When I lived in the sandhills of NC, I couldn’t get my potatoes to grow at all. i haven’t tried since I moved to Texas. Maybe I should do this next. I just have to find the right time to plant them in this hot weather climate. I’m guessing I should have them in in February at the latest. Keelie, From my research I understand that growing potatoes in Texas is a bit tricky. February and March seems to be suggested planting time so the plants can produce before the summer heat hits. I’ve grown potatoes in barrels for over ten years with great success. We eat the larger ones and save smaller ones to become our seed potatoes the following season. I only use blemish free seed potatoes and have had good success without the need to purchase seed potatoes each year. Margy, That is a great way to be self-sufficient. I love the barrel idea.